Punjab Govt. has started a New Initiative to provide Job opportunities to the Unemployed people of the State. The Name of the Scheme is Ghar Ghar Naukri Yojana or Ghar Ghar Rojgar Yojana Under this Scheme Rojgar Mela (Employment Fairs) are being Organized. The next job Fair is Going to Take place on 16th October 2018 at Guru angad Nagar, Street no- 2 Nawanshahr . Interested and Eligible Applicant will have to complete the online registration @ghargharrozgar.punjab.gov.in Website. In this article, we are sharing complete details regarding Punjab Ghar Ghar Naukri Yojana Job Fair. You can check the Eligibility Details, Important aspects here. Finally we share the Step by Step Process for Registration of Punjab Rojgar mela 2018. On 16th January 2018, This Scheme was announced by Technical Education and Industrial Training Minister Charanjeet Singh at Chandigarh. Various Rojgar Melas have been organized under this Scheme. The latest employment fair is on 16th October 2018 at Guru angad Nagar, Street no- 2 Nawanshahr. The Online Registration for the Ghar Ghar Naukri Scheme has already Started. If you haven’t registered yourself yet, Kindly read this article carefully and get registered. After the successful registration, you will have to update your profile i.e. Educational Qualification, Skills etc. 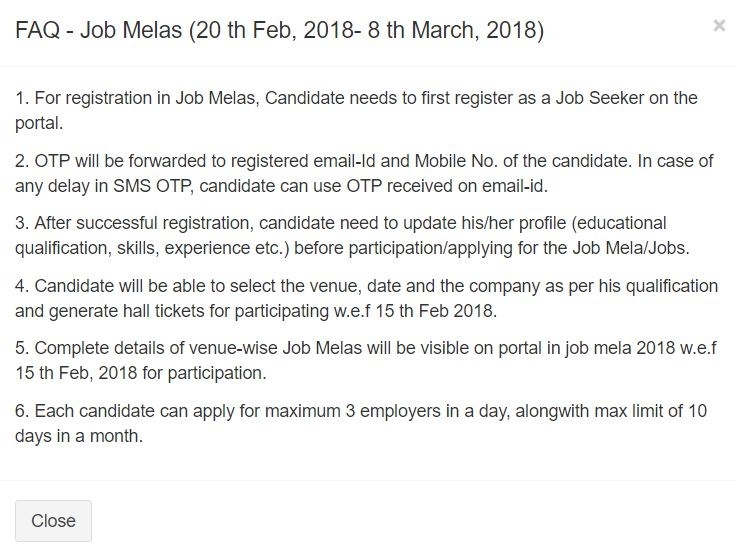 Note – Each candidate is eligible to apply for Maximum 3 Jobs under the Punjab Har Ghar Rojgar Mela Scheme. After The Account Creation, You will be able to make changes. Apko Khud hi Select Karni Hogi Sandeep Ji.